Weighing in today — I lost 2.8 pounds! AWESOME. I felt so great about it — that I felt light as a feather as I spent the day running errands, and then, er……got home and …um, started…..(clears throat)….to snack, and snack, and…….Oh bother! F.R.E.E.Z.E. F.R.A.M.E!!! It’s Ok. I caught myself. I reined it in. It just goes to show — I have alot more to learn…..and a whole life-time to do it. So, I logged it all in my WW online tracker. Took a deep breath. Filled up my water bottle. And planned a wonderful long bike ride for tomorrow. 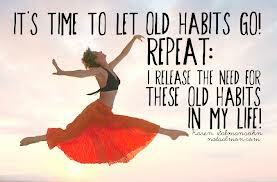 I Release the Need For These Old Habits In My Life!